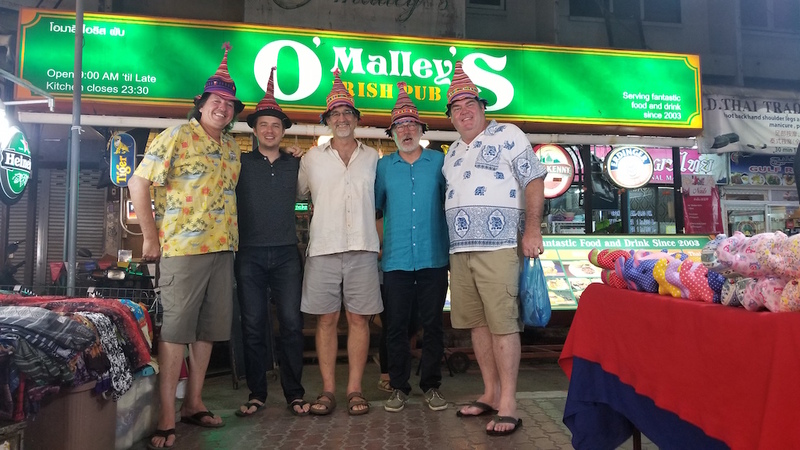 One of the most rewarding aspects of taking riders on adventures around the world is when they decide to ride with us again on a different trip. Not only is this a testament to the quality of the experiences that we offer, but it also gives us the opportunity to really get to know some riders on a deeper level, and share some truly remarkable experiences with them. In the past we have shared stories from MotoQuest riders like Lee Hobart and Robert Cormier, and this week we introduce to you Robert Arvizo, who has ridden with us on 9 different MotoQuest adventures over the last 12 years. 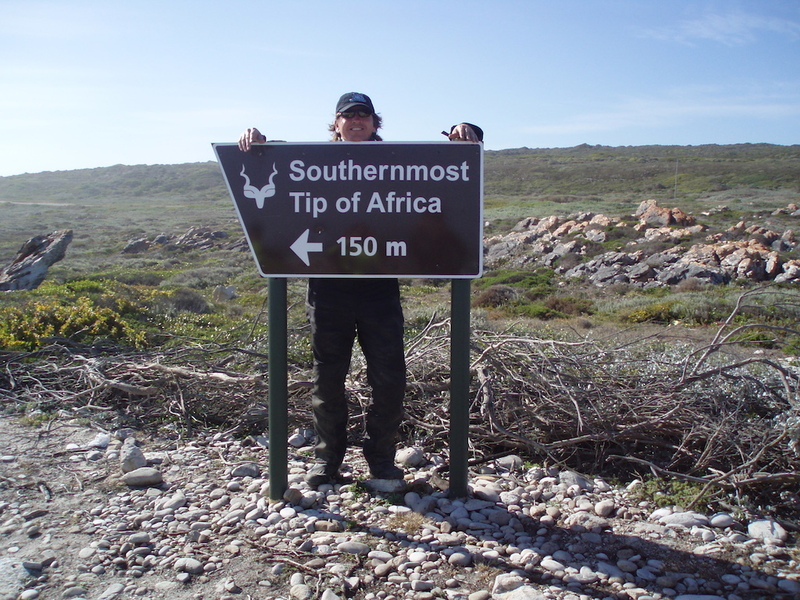 Robert is a great addition to any trip – always ready to have a good time, and always with a big smile on his face! 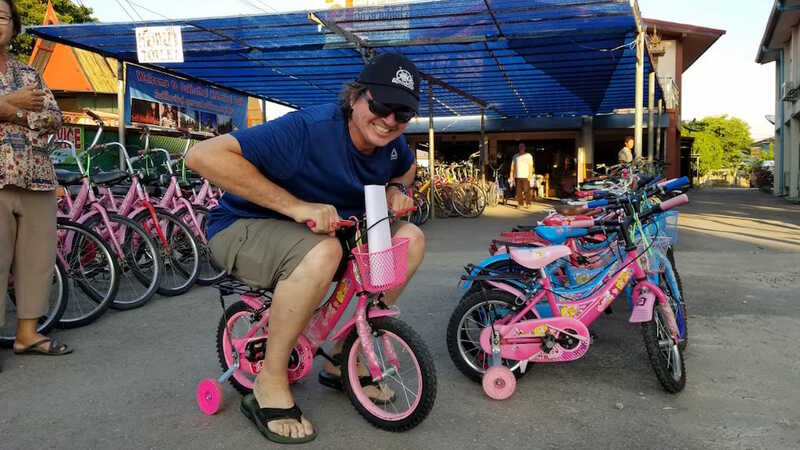 After riding with us in Laos in 2009, Robert returned to the region in late 2018 on our Thailand and Laos Golden Triangle Adventure. It was his first time back in that part of the world since his visit a decade before, which made for some especially memorable experiences. Tell us a little about your background with motorcycles. I started riding at age 24. I recall as a child always being interested in motorcycles, but due to “life circumstances” it was not going to happen until I left home and moved out on my own. My father died on a motorcycle when he was 30 years old, so my mother did not want me to ride. My first bike was a 1982 Honda CB750 Nighthawk, and my second was a 1985 BMW K100. I still own a 2006 BMW K1200S, but it does not get much riding time anymore. My riding experience through 2007 was primarily on California paved roads. Many miles ridden up and down the state, especially north on HWY 1 through Big Sur to Laguna Seca. MotoGP was an annual race at Laguna Seca until the event left California in 2014. Time in the saddle has slowed down for me since 2014, but I have since ridden a few desert and HWY 1 Big Sur runs. Traffic in California has grown considerably, and often for me it’s just not worth the hassle to gear up and get in traffic. How did you first come into contact with MotoQuest? I met Phil Freeman at one of his presentations at Irv Seaver BMW in 2006. Phil was selling “Alaska Touring” on motorcycles. He had pictures, videos, and looked like a lot of fun. Definitely a different riding experience from what I was accustomed to on my K 1200. 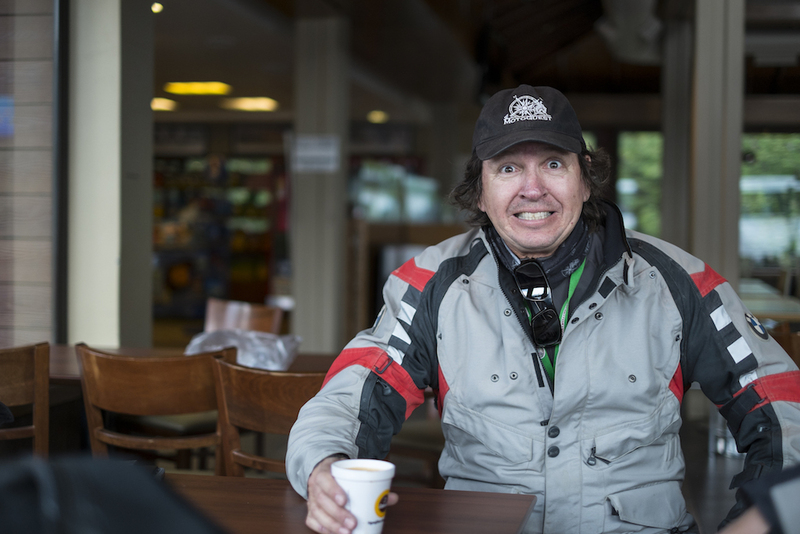 I signed up for a 2007 Alaska ride, recruited about 6-7 other riders from my work, who had also never ridden Alaska. What was your first experience riding with MotoQuest? 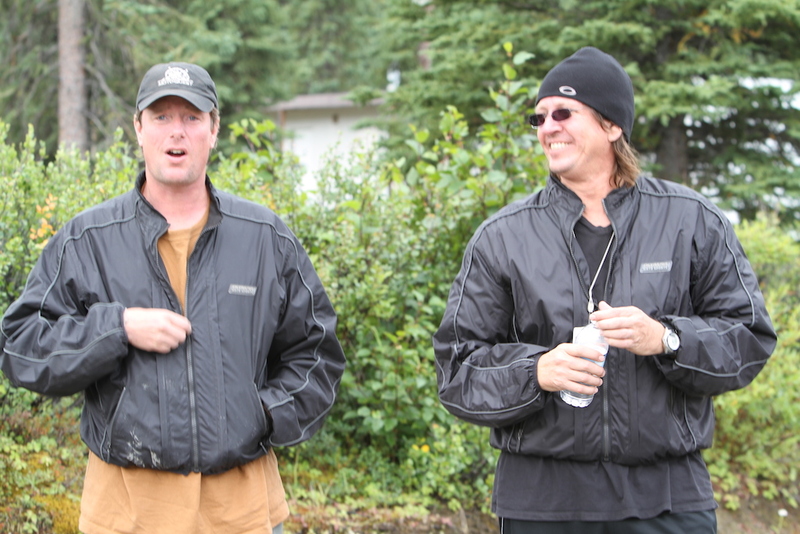 That first ride was MotoQuest’s 2007 Prudhoe Bay Adventure. This was a very real introduction to Alaska, riding to Prudhoe Bay and back to Anchorage on a KLR650. The road conditions varied from place to place with always stunning vistas as far as one could see. The guide and crew were competent and cordial, generally fun people to ride and hang out with. Overall impressions were almost overwhelming. From what I typically was used to riding – sunny California riding – Alaska was almost surreal. After this first experience with MotoQuest, I knew I was hooked on something good. At the age of 47, riding a dual sport was like riding for the first time again. And riding a motorcycle in conditions that were previously out of my comfort zone is now a welcomed challenge. Where else have you ridden with MotoQuest? 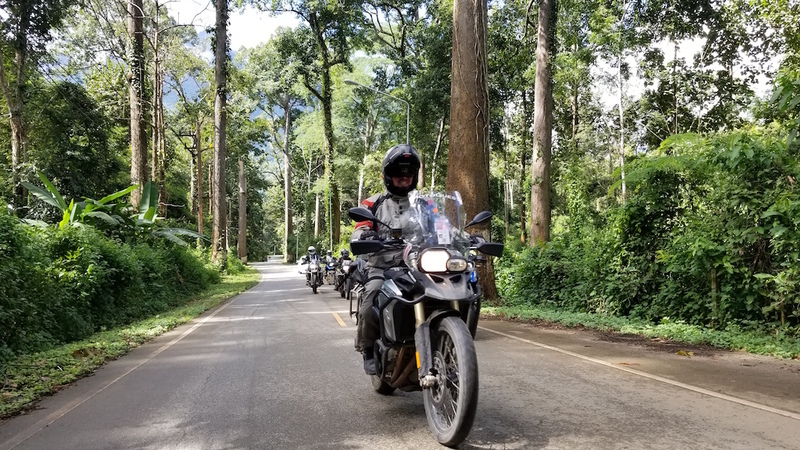 I have ridden with MotoQuest on a number of their guided adventures, including in Peru, South Africa, Patagonia, Ecuador and Thailand and Laos. Additionally, I have taken advantage of their Transporter Specials a few times, and rode with them up to Badger Pass in California for the Rendezvous in 2014. My passport from 2008 through 2014 was filled with stamps from MotoQuest tours. Your most recent venture with MotoQuest was on the Thailand and Laos Golden Triangle Scouting Trip. But this was not your first time riding in Laos. What was it like to return so many years later? I first rode Laos with MotoQuest in 2009. The overall experience for me was very satisfying and calming. The community and family efforts I encountered from village to village was very humbling. Many of the locals are poor by anyone’s standards, yet they often appear content. Young and old all involved in daily chores, all contributing to the family dinner table. Riding through villages and along mountain roads where locals line the roads is an experience that all riders appreciate. Adults and children wave and smile, flashing the peace sign as we pass through their villages. There are of course other obstacles that make the adventure more interesting, especially on mountain roads. Potholes, livestock, scooters, big rigs, rain, etc. Some of the conditions and experiences in this part of the world may not be for everyone, but for those that are willing to venture out of their comfort zone, the Golden Triangle tour is an outstanding experience. 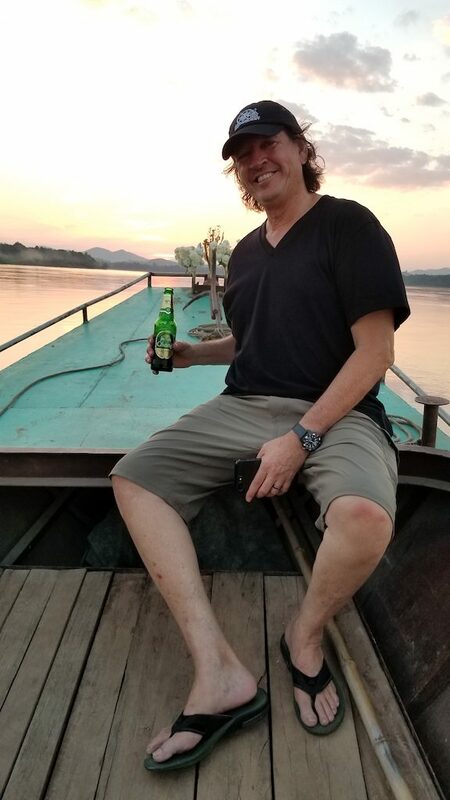 The people, food, sights, sounds and scents of Southeast Asia are a unique experience. I rode the last kilometers into Chiang Mai realizing that I might not see this part of the world again. With Brenden behind me running sweep, we pulled into our final destination to drop off the bikes with big grins. Goodbye people of Thailand and Laos. Do you have anymore trips with MotoQuest coming up? I have in the last 12-13 years established quite a few friendships through my MotoQuest adventures. The MotoQuest experience has allowed me to ride, see and appreciate the world on two wheels. Riding exposed to the elements on a motorcycle may not be for everyone, but for those that choose to, the rewards are worth the effort and risk.